Pioneering PET image reconstruction technology, providing up to 2x improvement in image quality (SNR). It also delivers Q.SUV, quantitative SUV you and your patients can trust. Accurately determining whether or not your patients are responding is critical, as enduring treatment is one of the toughest challenges they’ll ever face. One form of response measurement is SUV, standardized uptake value. 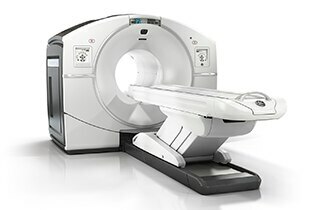 In PET, SUV quantitation is a communication language between imaging and referring physicians. The SUV accuracy defines how clear this language is. While conventional SUVs are under converged, SUVs delivered by Q.Clear are fully converged, hence more accurate and more consistent. This must be clearly communicated to reading and referring physicians that will look at the PET scan. Q.SUV is the SUV obtained from Q.Clear reconstruction. The Q is critical! This Q before SUV informs physicians that the quantitation data is more accurate and consistent than conventional methods. Q.SUV is part of our journey to make PET a great tool to help clinicians find and follow disease efficiently and consistently. Please download our Q.Clear White Paper for a detailed explanation of the technology and the definition of convergence, as well as an explanation of the negative impact an under-converged image has on quantitative accuracy. Also, please download our Q.SUV Primer to learn even more about the importance of quantitation in PET and why we believe the adoption of Q.SUV measurements is an important step to deliver more clarity and conclusiveness to referring physicians. A critical element in improving the value of PET for everyone - from reading physicians to referring physicians to patients - is the report produced by radiologists. The report needs to contain, hold and communicate more value. Its language and contents must continually improve so that reading physicians perceive PET as more conclusive and less subjective. Improving the communication among physicians on care teams comes down to improving the language of the PET report. We believe that Q.Clear and the Q.SUV measurement it produces will play a major role in improving these reports as quantitation is the communication language between reading physicians and referring physicians. So, improving quantitation improves communication. To read even more about how better reporting, as well as other areas of improvement, are elevating the value of PET, please download the entirety of this important article from Radiology Business Journal - Raising the Value of PET: Technology, Reliability and Reporting Take it Up a Notch.